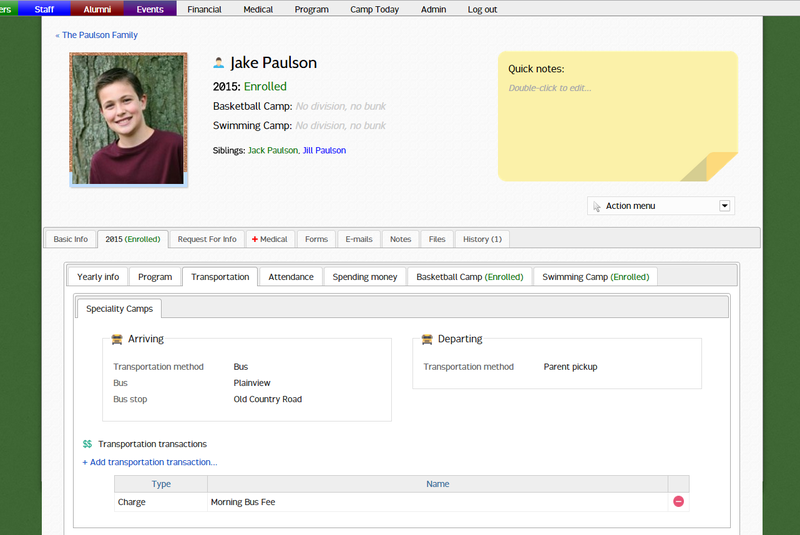 Transportation information can be viewed and managed for each session group administratively on the Camper Profile Page. Under the current year's tab on the camper profile page is a Transportation tab which contains sub-tabs for each session group in which the camper is enrolled. The Session Group tabs contains the Arriving and Departing transportation information for the camper, as well as any existing Transportation Transactions that have been added. Transportation options can be changed by double-clicking the appropriate field. Transportation transactions can be added or removed, if necessary. Adding transactions will automatically post the charge or discount on the family's financial record. If a transportation transaction is deleted, the corresponding charge or discount should be reversed on the Financial tab of the family's profile page.